Vintage 1965 Monaco Grand Prix Press Release. 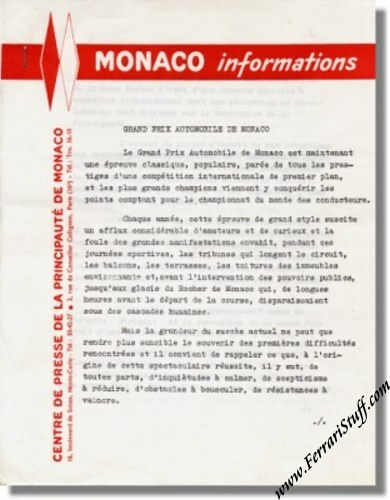 This is a vintage official press release that preceded the 1965 Monaco Grand Prix. It was issued by the Press Center of Monaco and counts 18 pages which elaborate on the upcoming race and historical data. Ferrari's Lorenzo Bandini worked his Ferrari 512 up from a 4th place on the grid to second place overall at 1 minute behind race winner Graham Hill on BRM. John Surtees managed a 4th place with his Ferrari 158 even though he ran out of fuel on the last lap.